The chickens created by years of Western-backed 'Palestinian' intransigence are coming home to roost. In the 23 years since the 'Palestinian Authority' was created, we continually heard the claim that they had to be armed in order to be the only law enforcement authority in the 'Palestinian territories.' But the 'Palestinian Authority' never chose to assert control, instead allowing all kinds of lawless gangs to arm themselves and inflict terror on Israelis. 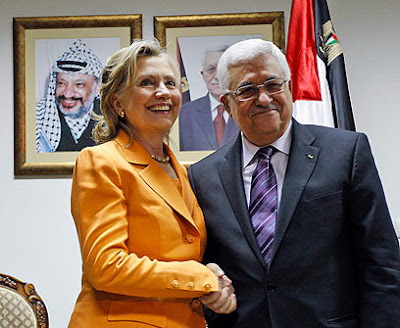 Now, those armed gangs are turning their guns on the 'Palestinian Authority.' And like in Gaza in 2007, Abu Mazen is losing control. Funny that he never speaks that way in front of the 'international community.' And this time it's really a lie. The chickens of years of Western-backed 'Palestinian' intransigence and weapons supplies are coming home to roost. And the 81-year old 'Abbas' - the 'moderate' hope of the Leftist West - may not last much longer. The Palestinian Authority is now paying the price for harboring, funding and inciting gang members and militiamen who until recently were hailed by many Palestinians as "heroes" and "resistance fighters." Unsurprisingly, most of these "outlaws" and "criminals" (as the PA describes them) are affiliated in one way or another with Mahmoud Abbas's Fatah faction. The situation in Nablus the past few days raises serious questions about the ability of the PA to perform basic security measures and rein in armed gangs and militiamen. Moreover, the unprecedented violence has further shattered Palestinian confidence in the PA and its leaders ahead of the local and municipal elections, scheduled to take place on October 8. Sounds like 2006 all over again, doesn't it? Pass the popcorn and read the whole thing.